A new month just around the corner and another brand new product! The Stojo collapsible cup has been making waves as the latest star of reusable design. Recently featured on This Morning and with many reviews online (including being named as one of the 10 best reusable coffee cups by the Independent) the Stojo is the ideal promotional item for the caffeinated traveller or on the move professional. Weighing in at just over 110g the new contender, when collapsed, measures just 3.5” in diameter and 1.75” in height. Its durable LFGB ­certified silicone rubber body makes it the perfect lightweight companion for the business market. The cup is available in Black, Blue, Green, Orange, Red and Pink (Subject to availability). The leak proof FDA­ grade recyclable polypropylene plastic lid helps avoid unwanted spillages and protects your vulnerable items from a liquid apocalypse. The Stojo cup also separates into its component parts for easy cleaning by hand or simply in the top-rack of the dishwasher. When it comes to personalisation the Stojo cup offers great pricing options for both single colour and full colour designs on the heat sleeve. Stojo offers a perfect portable space to keep your brand in mind with your environmentally conscious clients. Use your logo or get creative with some brand messaging…the choice is yours. 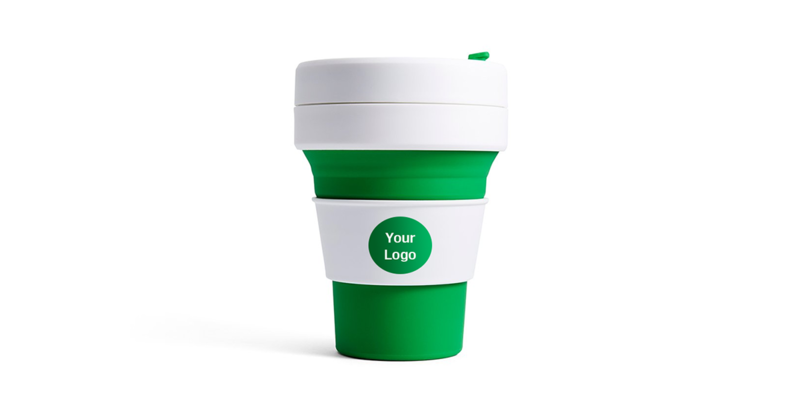 With the growing demand for companies to ditch the single use plastic and many shops offering ‘bring your own cup’ discounts, this is the perfect time to reward your current clients, or surprise your prospects with something modern, useful and portable.